Since we moved to town Hubby and I go out less and less…well we go out but it’s more like a “let’s go up to the bar and get a burger so I don’t have to cook type of thing”…not an actual date. We don’t leave and go bumming much anymore either. We used to go antiquing. That has come to an end too. We don’t go to shops much anymore at all. We find our stuff on auctions now. The farm house where we used to live was right on the farm where Hubby worked. He was so tired of being there that he often wanted to something to just get out of there. We had lived there for 15ish years so the “honey do” jobs were mostly done. It was easy for him to want to leave. Now days, he comes home and is happy to be here. We’ve only been in this house for 2 1/2 years. The “honey do” list is still long. We work extra hard on side jobs now that we have a house payment. So the date nights have gone aside and instead we settle for a half hour on the porch with a beer as our “away” or date time. I kind of miss the time away but am glad we’re not spending the money we used to…. No hotels…no destination restaurants. We’ve been trying to come up with somewhere we can go for a couple days and are drawing a complete blank. Home is best and we really love it here. I do find myself needing to run away at times as I am the one that is stuck living where I also work. It’s a danger of being an in home childcare provider. You work where you live! Thankfully the only place I usually away to is the thrift store…and that’s affordable!! 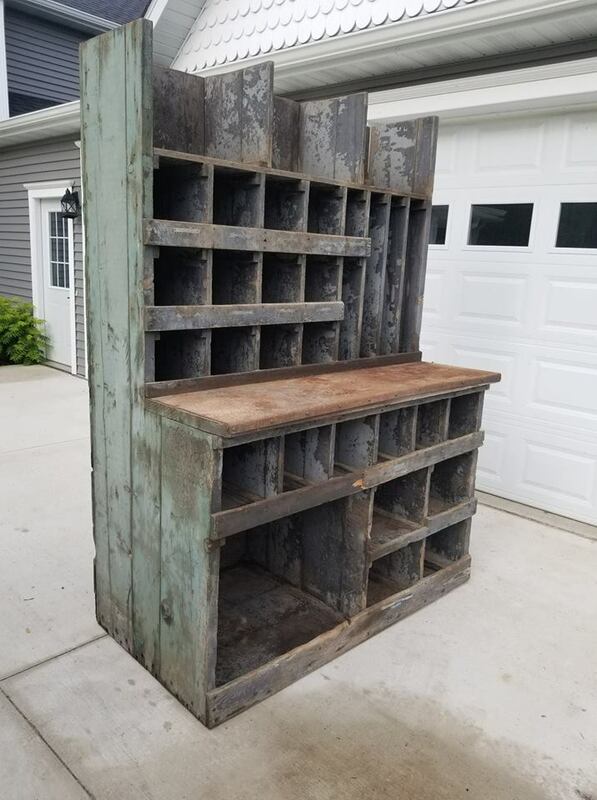 Well a couple weeks ago I saw this big old cabinet on the for sale group. 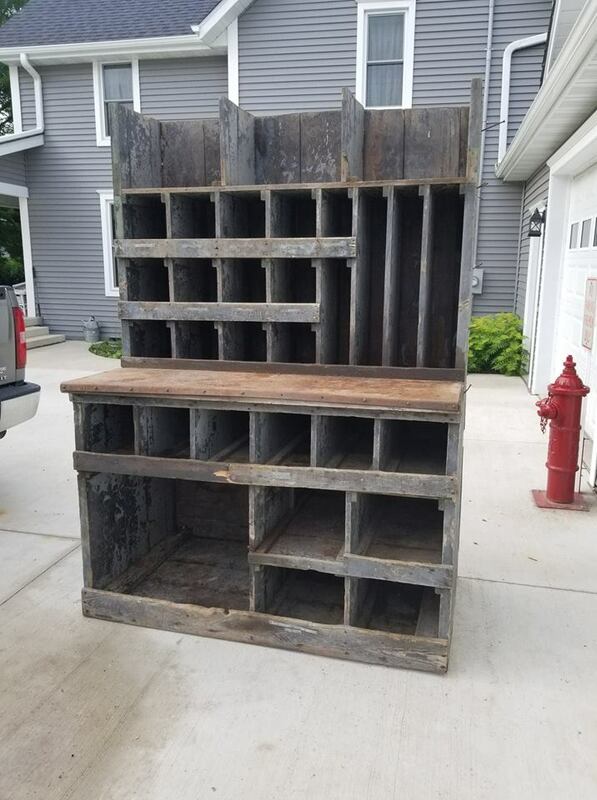 It was on an auction site and I’ve never done one of those. This was listed at $50. I (without asking Hubby) raised it to $55. Hubby came home and I told him about it. He loved the cabinet. Well the bid raised again and I raised again. I ended up getting it. The next problem was getting it home. I knew I’d need Hubby to help load it. It’s a monster. So I contacted the seller and asked if we could wait and pick it up later in the week. We knew them so it was okay. We explained that Hubby was mid harvest on the hay crop. They laughed and said they were too…so a couple days later on a Friday evening we left to go get it. We ended up staying at their house and chatting a hour or so and then asked them for a recommendation on where to go to eat. They suggested the bar in Ionia. In rural areas like ours, many of the bars serve as restaurants. They make a good portion of their money from serving burgers and lunch specials to the area folks by day and hearty suppers at night. Actually most of the places we go out to eat at are really little bar/restaurants. Around here if we say, “we’re going to the bar”. Everyone knows it’s to eat and not to excessively drink. Not knowing what to order as we haven’t been to the Hideaway Lounge we ended up ordering like we often do. I hodge-podge appetizer and a sandwich. 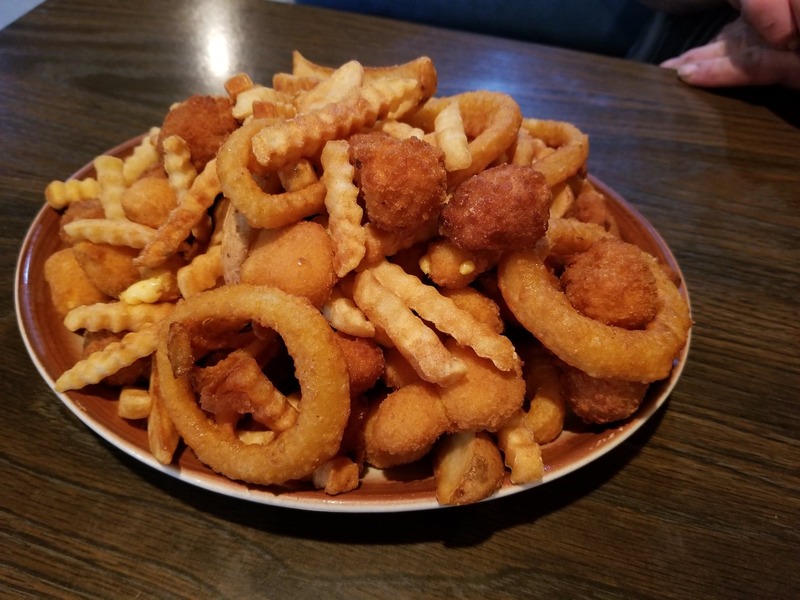 We weren’t super hungry but look what came for the hodge-podge of deep fried appetizers. It was HUGE! Along with that I got a Ruben sandwich and he got a burger. He finished his but I did not. I did not at all. The food was great bar and grill food and I know, should we ever go on a date night, we might venture this far, 25 minutes, again. It wasn’t what most people would classify as a date but for me, it was what I needed. It got me out of the house and gave me some time with Hubby. I treasure those times. Our total bill for the night with tip…$100. Not only did we get the food for that but the cabinet too….and what are we going to do with that? Who knows? We originally thought we’d put it in the garage and he’d use it as a work station. Now after we see how incredibly gigantic it is…we’re not sure. Got any ideas for us? This entry was posted in Jo's Journal on June 29, 2018 by Jo. Refinished and with doors on the top would be great for cookie sheets, 9 x 13 pans, casserole dishes, etc. I’m sure when you get done with it will look totally different and useful. Or what about on the patio for kids toys or a potting place for plants. My husband and I have ‘dates’ to the farm store and W-M alternating with Aldi shopping on Sunday mornings with a late breakfast or early lunch. We started this when our son still lived at home and used it as a little time for ourselves. Looking forward to seeing what you do with the cabinet. Could the cabinet go in the antique store? As a display piece with a slightly higher price than you would normally do? $100 for the cabinet AND dinner? Sweet deal!!! We farm and I have learned that even a run for parts counts as together time. Everyone does what works best for them wherever they are in life and it can change, as you have experienced. Living on a farm and having hubby run a farm implement business, delivering a rock picker/swather/any implement is “date night”, especially April through September!! Sounds like a good date to me! Love the cabinet! Needs a top! That cabinet is awesome. What about using it outside in your backyard as a potting table or for when you have barbeques? You could use it as a stand to hold the food and bbq fixings..